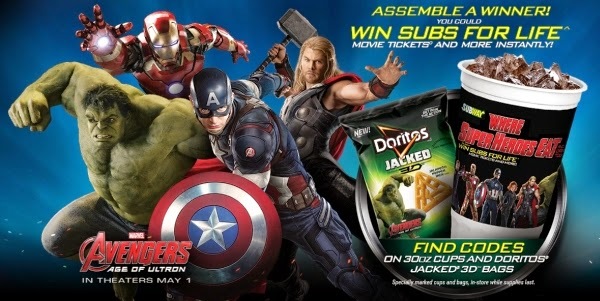 Home / Avengers / Avengers_Age_Ultron / Avengers-2 / Contest / How to Win AVENGERS: AGE OF ULTRON Subway Prizes! Right now Subway is running an awesome contest and we decided to make it even sweeter. My brother and I have the chance to go to see Avengers 2&nbsp;in LA and you can help. As if we weren't excited enough about the Avengers sequel we were told we can win a free trip to the premiere two weeks early. If we get the most retweets by 4/6 (Monday) we get a free trip to LA to watch the premiere of Avengers: Age of Ultron! When we go we'll be live tweeting our trip and taking you guys with us every step of the way. We'll be sending out a number of tweets for the next few days and all you have to do is share it. To show how much we appreciate your help, we'll be giving away an exclusive prize pack courtesy of Subway so you can enjoy dinner and a movie when you go. We'll be sending out special tweets about the promotion during the next few days. We'll select a random follower from the list of the top retweeters and give them a prize. At the end of the promotion on Sunday (4/5/2015), if we get the highest number of RT for the promotion, then we'll pick a random follower from the list of highest retweeters and you get a special prize. Followers must be in U.S (see Disclaimer below). A Tweet that you forward to your followers is known as a Retweet. A pop-up will show you the Tweet you're about to Retweet&nbsp;and will ask you to confirm. The Tweet will then be shared with all of your followers! Please do not modify or add commentary to the Retweet&nbsp;so we can track it. We'll be keeping track of the biggest retweeters and give away a Subway gift card every day to the person that retweets the most! In addition to the contest, I had a horrible experience trying to buy an Avengers cup because they sold out so fast. So follow me on Twitter to see if I can find how many Subways in the Phoenix area actually still sell cups. Why not head to a Subway near you and see if they sold out? They're going fast! So what are you waiting for? Follow us on Twitter and retweet our #WhereSuperheroesEat tweets! Tell your friends and family! We appreciate all your help! Are you excited about Avengers Age of Ultron? Would you help us go to see Avengers: Age of Ultron in L.A.? Just Tweeted! Although not sure how many subs I could eat in my lifetime. Good luck on getting to the premiere! And finding some cups and toys in Phoenix. Since Subway is the #2 fast food chain behind McDonald's you'd think they'd have some somewhere. Consider it done... well working on it, but done! Thanks Jeremy I saw that and we appreciate it!